The aim of this study was to compare lumpectomy cavity depth measurements obtained through ultrasound (U/S) and retrospective computed tomography (CT). Twenty-five patients with stage T1-2 invasive breast cancer formed the cohort of this study. Their U/S and CT measurements were converted into electron energy and compared. The mean U/S depth was 3.6 ± 1.3 cm, while the mean CT depth was 4.9 ± 1.9 cm; the listed error ranges are one standard deviation. Electron energies for treatment ranged from 6 MeV to 12 MeV based on the U/S determination. 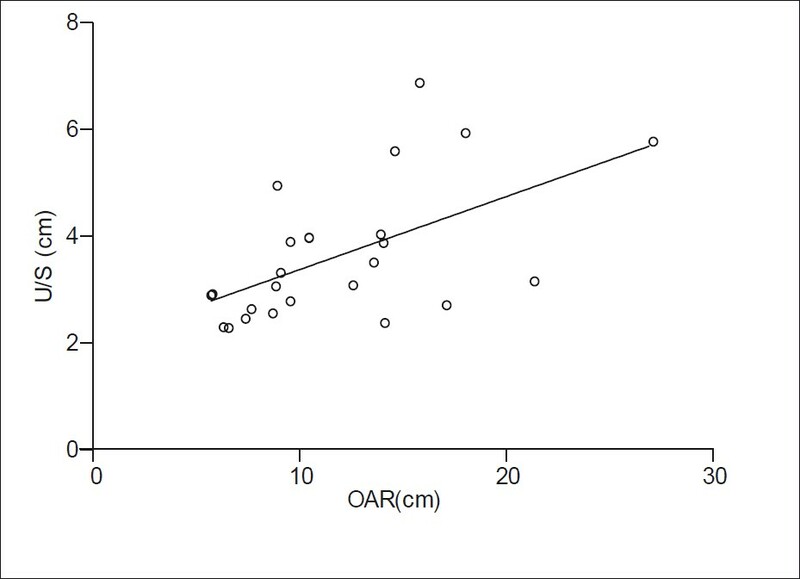 There was no significant correlation between cavity depths measured by U/S and CT (R 2 = 0.459, P < 0.002). Furthermore, only 20% of CT-based electron energy determinations matched the corresponding U/S determinations. This ratio increased to 40% when taking into account an upper limit based on the depth of organs at risk below the cavity. The study shows that there is a significant discrepancy between cavity depths determined by U/S and CT. It also supports the concept that post-lumpectomy radiotherapy boosts should be tailored according to the needs and comfort of individual practices and institutions. Cancer of the breast is one of the most devastating malignancies in women between the ages of 40 and 50 in the USA. A combination of lumpectomy and radiotherapy remains the most common option for women in stage I or stage II. ,,,,, The standard technique is to treat the whole breast via tangential fields, up to a total dose of 45-50 Gy. In most cases, this treatment is followed by a 10-15 Gy electron boost to the tumor bed to reduce the likelihood of recurrence. , The tumor bed volume is estimated post-surgery from clinical and radiological information and is then used to determine the appropriate electron energy. Accurate delineation of the target volume is essential when delivering external beam radiotherapy to the tumor bed. Electron boost plans are often set up with a margin of 2-3 cm, which, according to several reports, , results in some geographical misses and unintended outcomes. Different institutions use various techniques for target delineation, e.g. ultrasound (U/S), computed tomography (CT), surgical clips, and scars. U/S is mainly employed for cavity size and depth determination when radiation has not been significantly delayed after surgery. Combining the information from surgical clips with CT scans has also been shown to properly determine the tumor bed. The main advantages of a CT scan are better visualization of the post-operative state and lower risk to normal breast tissues in as many as 50% of the cases. Its main difficulties are differentiating glandular breast tissues from surrounding anatomy and combining cavity images from different window settings. For these reasons, it is widely believed that U/S is a more accurate method of defining boost fields and prescribing an appropriate depth. In this study, the CT scans were performed 3 days before the start of whole breast irradiation after post-op and post-chemo. U/S was performed 2 days before the completion of whole breast irradiation. Oh et al. showed that the volume of the lumpectomy cavity reduced significantly after whole breast radiation therapy (WBRT) and demonstrated a strong correlation between the presence of seroma and the reduced volume. Therefore, large volume reduction of the lumpectomy cavity may lead to excessive normal breast tissue irradiation, and may also have an impact on the accuracy of boost irradiation planning, leading to significant effects on dose homogeneity in the treatment volume. The aim of this study is to analyze cavity depths and subsequent electron energies derived from U/S and retrospective CT measurements. The electron energy is determined by taking into consideration the minimum depth of organs at risk as well as the maximum cavity depth. Twenty-five patients having undergone radiotherapy for early-stage breast cancer after breast-conserving surgery were included in this study. A plan for electron boost treatment was computed for each patient from tomographic (CT) scans in the treatment position. Before the CT scans, skin marks were placed to locate the boost volume isocenter and enable patient repositioning during treatment. Radiopaque wires and markers were placed to locate palpable breasts scars and skin marks on the CT images. All CT data were transferred to Eclipse (Varian Medical Systems Inc., Palo Alto, CA, USA), a 3D treatment planning system. Two days before completion of the treatment , the same breast cancer patients underwent diagnostic U/S in the radiation treatment position. The localization and determination of depth of the lumpectomy cavity was performed by the X-ray tech on duty with the radiation oncologist on-site to finalize decisions as to the skin markings outlines the boost site.Under the guidance of the radiation oncologist, the tumor bed volume is identified more accurately thereby reducing inter-operator variability.. The dimensions of the cavity-based U/S included transverse (medial to lateral), longitudinal (superior-inferior) and depth (skin to posterior portion of the cavity) measurement. These examinations were performed with a standard U/S device (HDI 5000; Philips Andover, MA, USA) using a broadband curved array transducer working at 2-5 MHz and a broadband linear array working at 4-7 MHz. Imaging errors can be kept to a minimum by using the linear array for most measurements. However, the curved array provides better penetration depth. The site was marked on the skin before measurement. The target depth is defined as the deepest aspect of the cavity plus a 1.5 cm margin. Treatment fields were prescribed with a 1.5 cm margin on the cavity, and electron energy (E 1 ) was chosen to cover the target depth. where R oa and Rc av are in cm and E 3 in Mev. The energy E3 is chosen among the closest energies (6, 9, 12, 16, 20 Mev) from our linear accelerator (21 EX Varian Medical Systems Inc., Palo Alto, CA, USA) electron energiesThe advantages and disadvantage of various methods for breast delineation in electron boost therapy are summarized in [Table 1]. Descriptive statistics were calculated for the various cavity depth measurements of all 25 patients. 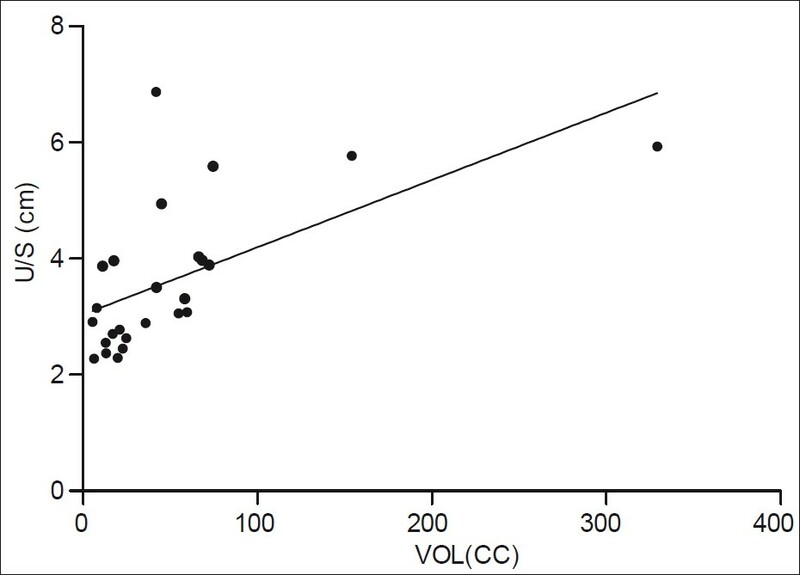 The differences observed between the U/S and the CT mean values and standard deviations were deemed significant using the paired t-test. 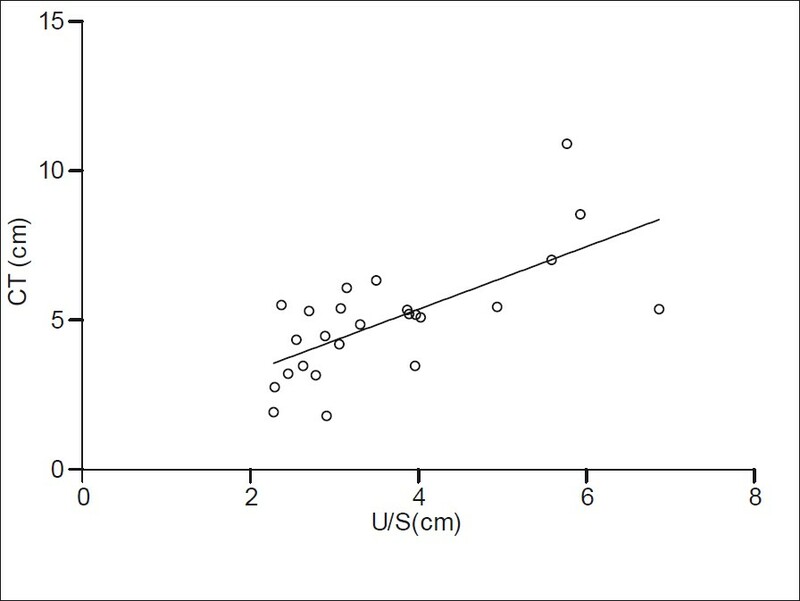 A scatter plot of U/S and CT cavity depth measurements is shown in [Figure 1], and a regression line was fit to the data. Note that additional factors such as organs at risk and breast volume are associated with the cavity depth. The level of agreement between the two tests was assessed using two statistical methods. First, a concordance correlation coefficient (CC) was calculated as CC = Px C b , and defined as the product of an accuracy measure (in this case the bias correction factor, C b ) and a precision measure (the Pearson correlation coefficient, P). Second, we apply the Bland-Altman  method of assessing agreement. This approach plots the mean of each data pair against its difference, and defines the 95% limits of agreement as the average difference plus or minus 1.96-times the standard deviation of the difference. All statistical calculations were performed using the statistical package Graphpad Prism (La Jolla, CA, USA). P-values less than 0.05 were considered statistically significant. 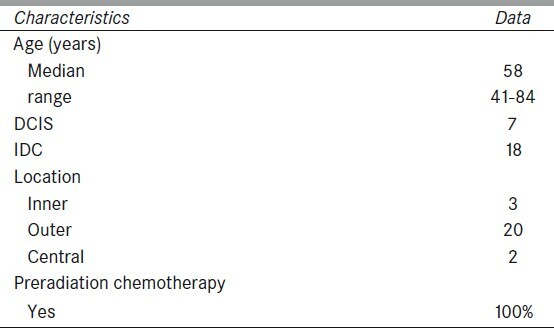 Various patient and tumor characteristics are shown in [Table 2]. The median age of the 25 patients was 58 years (range: 41-84 years). Eighteen of the patients were diagnosed with invasive ductal carcinoma, while seven had ductal carcinoma in situ. All patients had negative surgical margin. Most of the tumors were located in the outer quadrants, and most lesions (80%) were less than 2 cm in diameter. All 25 patients received a doxorubicin-based chemotherapy regimen before radiotherapy. Twelve underwent an additional hormone regimen (Tamoxifen) before radiotherapy. [Table 3] shows the dosimetric parameters analyzed in this study. 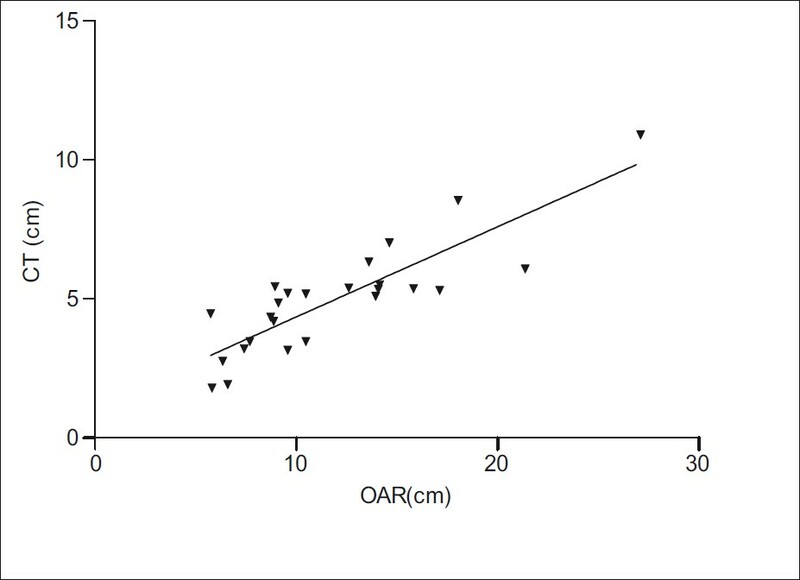 Depth cavity estimates from U/S and CT measurements [Figure 1] correlated poorly (Pearson's correlation coefficient r = 0.46, 95% confidence interval [CI] 0.56-1.54, P < 0.0002). The CT cavity depths were consistently larger than the U/S cavity depths [Table 3]. The mean cavity depth through U/S was 3.6 cm (median 3.2), and the mean CT depth was 4.9 cm (median 5.2). In addition, depending on the location of the breast, the mean estimated depth of organs at risk was 11.9 cm (median 10.5). On average, CT depths were 40% greater than U/S depths. The CC was 0.46 (95% CI: 0.22-0.65). This value is based on a correlation coefficient P of 0.68, consistent with moderate precision, and a C b of 0.68. The latter shows that the best-fit line was not close to the line of perfect agreement. According to the Bland and Altman method [Figure 2], the mean difference between the two tests was 1.3 cm (standard deviation: 1.5); therefore, the 95% limits of agreement are −1.5 and 4.2 cm. In [Figure 2], the solid line represents the mean difference and the dashed lines are offset by ±1.96 standard deviation from the mean. 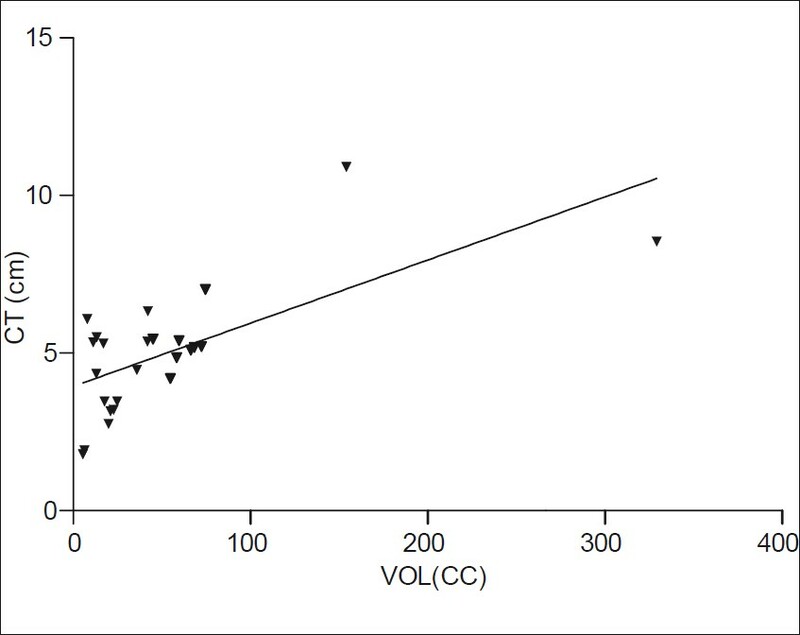 The tumor bed volume was correlated with the cavity depth in both U/S and CT measurements [Figure 3] and [Figure 4]. 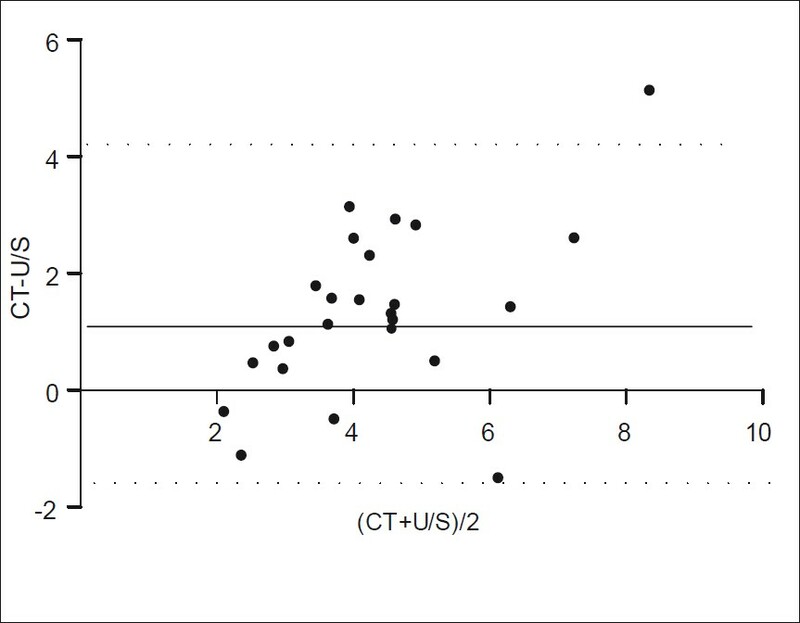 The CT depths exhibited somewhat stronger correlation (P = 0.46) than the U/S depths (P = 0.37). The depth of organs at risk (such as lung or heart), which depends on the location of the breast, is plotted against U/S and CT depths in [Figure 5] and [Figure 6]. Again, the CT depths exhibit stronger correlation (P = 0.73) than the U/S depths (P = 0.31), but, in this case, the difference is much more dramatic. Localization of a lumpectomy cavity for boost radiation can be accomplished using U/S, CT, surgical clips, other methods or a combination of techniques. Determination of the cavity depth, however, is still not exact. This measurement is based on either U/S or CT. Depending on the location of the lumpectomy scar, boost radiation misses a portion of the cavity in 20-68% of the cases. Our study has confirmed that electron energies based on cavity depth are different under the U/S and CT measurements. Only 20% of the CT-based depth energies agreed with those determined by U/S. Considering the increasing gap between surgery and radiotherapy planning and treatment, U/S may well underestimate the tumor bed and its margins. , In the majority of cancer centers, a single pre-treatment CT is used for both the initial breast irradiation and the boost, without regard for the biological modifications caused by surgery. Therefore, exact delineation of the target volume is essential for tumor bed electron boost therapy. An accurate determination of cavity depth is instrumental in ensuring adequate coverage of the tumor bed while sparing normal tissue. Because therapeutic decisions are frequently based on the size and depth of the cavity, it is important that cavity length measurements be consistent. This criterion should apply to both repeated measurements and those made by different operators. No clinical limits of agreement were provided for this study; thus, our data may suffer from inter-operator and intra-operator variability. To partially address this problem, we calculated the bias between the two U/S and CT measurements using a Bland-Altman  plot. The divergence between U/S and CT depths may also come from variations in the mode of U/S data acquisition: improper probe pressure, an untrained technician or a combination of factors can contribute to the 40% difference in cavity depths obtained by the two methods. In one study, Helyer et al. reported that the electron energy derived from U/S depth cavity location has to be changed in approximately 60% of the patients when the data are compared with clinical localization. The same concerns were echoed by Birdwell et al. in a similar fashion. The accuracy of site size and depth estimates obtained by other methods has been also investigated in the literature. Macthay et al. reported on 316 cases where the cavity depth and location of the excision were based on surgical scars alone. They showed that inadequate coverage happens in 10-36% of the cases. Furthermore, Oh et al. demonstrated that CT scans guided by the scar and obtained before the start of the boost do not guarantee success: 53.8% of the cases resulted in geographical misses. A similar observation was made by Regine et al. in a study of 17 patients using CT planning. Only 29% of the patients received adequate treatment; the rest experienced various geographical misses. While traditional electron beams with cut-outs were used for boost irradiation in the present study, others have reported on the dosimetric results of more innovative methods. Vaidya et al. reported a local recurrence of 2.6% after 5 years when an intra-operative radiotherapy (IORT) boost was followed by external beam radiation therapy. Lemanski et al. also suggest that IORT be given as a boost after breast-conserving surgery, rather than conventional fractionated boost radiation. Reitsamer et al. showed that immediate IORT boost and WBRT yield excellent local control at 5 years. Furthermore, their approach was associated with a significantly lower rate of ipsilateral breast tumor recurrence compared with a similar cohort treated with WBRT and conventional boost. Luini et al. noted that IORT aids in breast conservation, as reducing the radiation field dramatically reduces the exposure of normal tissues. Furthermore, the patient's quality of life is better because the radiation course is much shorter: one session rather than 5-6 weeks. There are conflicting reports on the performance of various imaging procedures for cavity depth and localization. Each method has advantages and disadvantages. Compared with U/S measurements, the CT images obtained in our study yield electron energies approximately 40% higher due to the changes in cavity characteristics and size associated with an increased interval between surgery and data collection, as well as the effects of radiation on soft tissues. Because the CT images are presumably poorer, U/S is commonly thought to be a more accurate method of defining boost fields and prescribing the appropriate depth. This study shows that U/S and CT provide different results. Therefore, the need of a third party such as surgical clips is paramount for better depth cavity determination. It is urgent for breast surgeons to place surgical clips in the walls of the lumpectomy cavity to allow CT and U/S to be used interchangeably and also as a combined technique. 1. Ries LA, Eisner MP, Kosary CL. SEER Cancer Statistics Review, 1973-1997. National Cancer Institute, Bethesda, MD, USA 2000. 2. Arriagada R, Le MG, Rochard F. Conservative treatment versus mastectomy in early breast cancer: patterns of failure with 15 years of follow-up data. J Clin Oncol 1996;14:1558-64. 3. Blichert-Toft M, Rose C, Andersen JA. Danish randomized trial comparing breast conservation therapy with mastectomy: Six years of life-table analysis. J Natl Cancer Inst Monogr 1992;11:19-25. 4. Fisher B, Anderson S, Redmond CK. Reanalysis and results after 12 years of follow-up in a randomized clinical trial comparing total mastectomy with lumpectomy with or without irradiation in the treatment of breast cancer. N Engl J Med 1995;33:1456-61. 5. Lichter AS, Lippman ME, Danforth DN. Mastectomy versus breast-conserving therapy in the treatment of stage I and II carcinoma of the breast: A randomized trial at the National Cancer Institute. J Clin Oncol 1992;10:976-83. 6. Van Dongen JA, Bartelink H, Fentiman IS. Randomized clinical trial to assess the value of breast-conserving therapy in stage I and II breast cancer, EORTC 10801 Trial. J Natl Cancer Inst Monogr 1992;11:15-8. 7. Veronesi U, Salvadori B, Luini A. Breast conservation is a safe method in patients with small cancer of the breast: Long term results of three randomized trials of 1973 patients. Eur J Cancer 1995;31A:1574-9. 8. Schnitt SJ, Abner A, Gelman R, Connolly JL, Recht A, Duda RB, et al. The relationship between microscopic margins of resection and the risk of local recurrence in patients with breast cancer treated with breast-conserving surgery and radiation therapy. Cancer 1994;74:1746-51. 9. Fisher ER, Anderson S, Redmond C, Fisher B. Ipsilateral breast tumor recurrence and survival following lumpectomy and irradiation: Pathological findings from NSABP protocol B-06. Semin Surg Oncol 1992; 8:161-6. 10. Oh KS. Feng MK, Kent AG, Yanke B, Pierce LJ. Planning the breast tumor bed boost: Changes in the excision cavity volume and surgical scar location after breast-conserving surgery and whole breast irradiation. Int J Radiat Oncol Biol Phys 2006;66:680-6. 11. Regine WF, Ayyangar KM, Komarnicky LT, Bhandare N, Mansfield CM. Computer-CT planning of the electron boost in definitive breast irradiation. Int J Radiat Oncol Biol Phys 1991;20:121- 5. 12. Warszawski A, Baumann R, Karstens JH. Sonographic guidance for electron boost planning after breast-conserving surgery . J Clin Ultrasound JCU 2004;32:333-7. 13. Goldberg H, Prosnitz RG, Olson JA, Marks LB. Definition of postlumpectomy tumor bed for radiotherapy for radiotherapy boost field planning: CT versus surgical clips. Int J Radiat Oncol Biol Phys 2005;63:209-13. 14. Smitt MC, Birdwell RL, Goffinet DR. Breast electron boost planning: Comparison of CT and US. Radiology 2001;219:203-6. 15. Berrang TS, Truong PT, Popescu C, Drever L, Kader HA, Hilts ML, et al. 3D ultrasound can contribute to planning CT to define the target for partial breast radiotherapy. Int J Radiat Oncol Biol Phys 2009;73:375-83. 16. Bartelink H, Horiot JC, Poortmans P, Struikmans H, Van den Bogaert W, Barillot I: Recurrence rates after treatment of breast cancer with standard radiotherapy with or without additional radiation. N Eng J Med 2001;345:1378-87. 17. Wong P, Heimann R, Hard D, Archambault J, Muanza T, K. Sultanem K: A multi-institutional comparison study evaluating the use of 3D-ultrasound for defining the breast tumor bed for IGRT in chemotherapy versus non-chemotherapy patients. Int J Radiat Oncol Biol Phys 2008; 72:S179-80. 18. Bland JM, Altman DG. Statistical methods for assessing agreement between two methods of clinical measurement. Lancet 1986;1:307- 10. 19. Bedwinek J. Breast conserving surgery and irradiation: The importance of demarcating the excision cavity with surgical clips. Int J Radiat Oncol Biol Phys 1993;26:675-9. 20. Machtay M, Lanciano R, Hoffman J, Hanks GE. Inaccuracies in using the lumpectomy scar for planning electron boosts in primary breast carcinoma. Int J Radiat Oncol Biol Phys 1994;30:43-8. 21. Kovner F, Agay R, Merimsky O, Stadler J, Klausner J, Inbar M. Clips and scar as the guidelines for breast radiation boost after lumpectomy. Eur J Surg Oncol 1999;25:483-6. 22. Polgar C, Major T, Fodor J, Nemeth G, Orosz Z, Sulyok Z. High-dose-rate brachytherapy alone versus whole breast radiotherapy with or without tumor bed boost after breast-conserving surgery: Seven-year results of a comparative study. Int J Radiat Oncol Biol Phys 2004;60:1173-81. 23. Leonard C, Harlow CL, Coffin C. Use of ultrasound to guide radiation boost planning following lumpectomy for carcinoma of the breast. Int J Radiat Oncol Biol Phys 1993;27:1193-7. 24. Stolier AJ, Fuhrman GM, Scroggins TG, Boyer CI. Postlumpectomy insertion of MammoSite brachytherapy device using the scar entry technique: Initial experience and technical considerations. Breast J 2005;11:199-203. 25. Helyer SJ, Moskovic E, Ashley S, Hastings L, Yarnold JR. A study testing the routine use of ultrasound measurements when selecting the electron energy for breast boost radiotherapy. Clin Oncol 1999;11:164-8. 26. Birdwell RL, Ikeda DM, Torrey MJ, Goffinet DR. Sonographic tailoring of electron beam boost site after lumpectomy and radiation therapy for breast cancer. AJR Am J Roentgenol 1997;168:39-40. 27. Macthay M, Lanciano R, Hoffman J, Hank GE. Inaccuracies in using lumpectomy scar for planning electron boosts in primary breast carcinoma. Int J Radiat Oncol Biol Phys 1994;30:43-8. 28. Vaidya JS, Baum M, Tobias JS, Massarut S, Wenz F, Murphy O, et al. Targeted intraoperative radiotherapy (TARGIT) yields very low recurrence rates when given as a boost. Int J Radiat Oncol Biol Phys 2006;66:1335-8. 29. Lemanski C, Azria D, Thezenas S, Gutowski M, Saint-Aubert B, Rouanet P, et al. Intraoperative radiotherapy given as a boost for early breast cancer: Long-term clinical and cosmetic results. Int J Radiat Oncol Biol Phys 2006;64:1410-5. 30. Reitsamer R, Sedlmayer F, Kopp M, Kametriser G, Menzel C, Deutschmann, et al. The Salzburg concept of intraoperative radiotherapy for breast cancer: Results and considerations. Int J Cancer 2006;118:2882-7. 31. Luini A, Orecchia R, Gatti G, Intra M, Ciocca M, Galimberti V, et al. The pilot trial on intraoperative radiotherapy with electrons (ELIOT): Update on the results. Breast Cancer Res Treat 2005;93:55- 9.